Even my fairwear ends up with middle-class sensibilities! I’d been needing a new fair bodice for a couple of years now, but my stash took its own sweet time deciding what it wanted to be. I finally pulled together a couple of great home dec fabrics: an olive/gold/copper chenille stripe that’s been in my stash since the Jurassic Era, and a black cotton-blend harlequin pattern that I’ve coveted at JoAnn for years, but at THIRTY SIX DOLLARS A YARD was way beyond my budget. Until last year, when the stars (and the coupons and a birthday gift card from my lovely sister-in-law and nephews) aligned, and it became mine. Bwa-ha-ha-ha! Ahem. 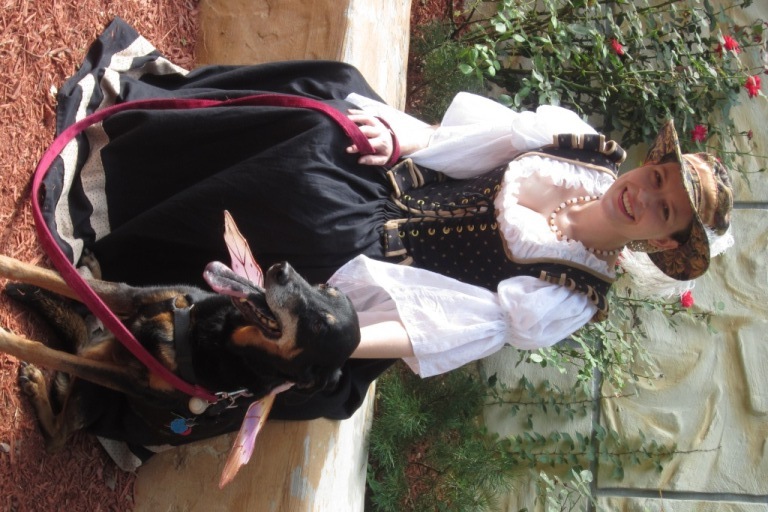 With the addition of tabs and binding, and, of course, the BEST accessory—a matching dog!—I have two new looks in one versatile piece. Finally. 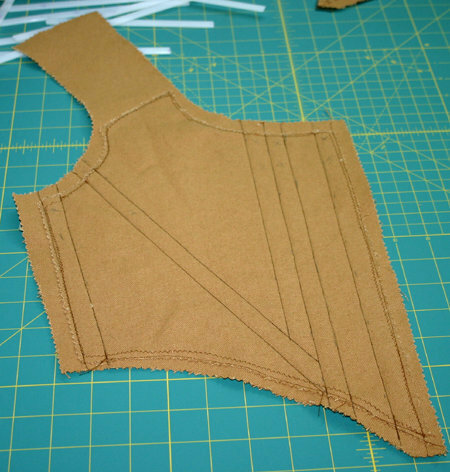 Other costumers have made convincing points about reversible bodices—that they always bend, somewhere, and that they’ll tend to conform to your body more one one side than the other, rendering the reverse side ill-fitting and uncomfortable. I, personally, like to make all my fairwear bodices reversible (you have to line them anyway), and I’ve never had an issue. YMMV. 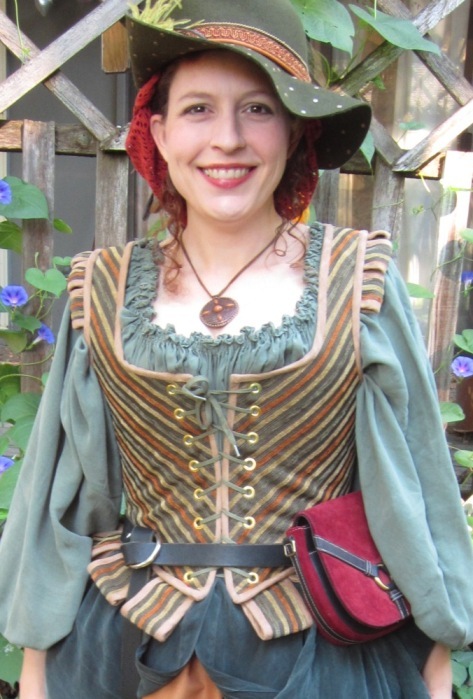 The pattern I use is an adaptation of my basic bodice block, which actually began life many years ago when I copied the very first fair bodice I ever bought (follow that?!). I start with two layers of heavy cotton canvas for the interlining (I’ve found good prices at Hobby Lobby and Hamilton Dry Goods), sewn together to form the casings for the boning. You can see the boning channels faintly marked in pencil. From left (side seam) to right (front opening), there are five bones (in this case, heavy duty Malco brand cable ties): One at the side seam, one diagonal from waistline to armscye, two vertical bones, a gap for the lacing, and one at the front edges. 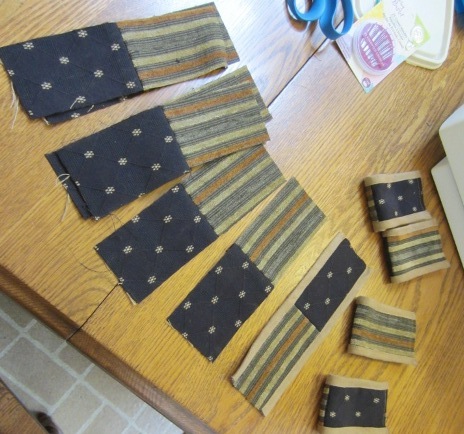 The tabs for the waist are roughly 3″ long by 2″ wide, or at least they started out that way. After fitting and trimming they are quite a bit shorter (about 3/4″) and a small bit narrower. The shoulder tabs are a little less than 2″x2″ square. A helpful friend with a RTW bodice measured her own tabs, and I jiggered that with my waist measurement. Instead of cutting individual tabs, I cut a long strip of each fabric, the width of ALL the tabs (so like 29″ long) by the length of ONE tab, plus seam allowances on both sides (4″). It was easier to do than to explain! I sewed the strip along the bottom seam, flipped and pressed it, then sliced them into tab sections, seen above. Because this is meant to be Fairwear, not a historical piece, I used big ol’ brass grommets for the lacing. I don’t mind the look, personally. 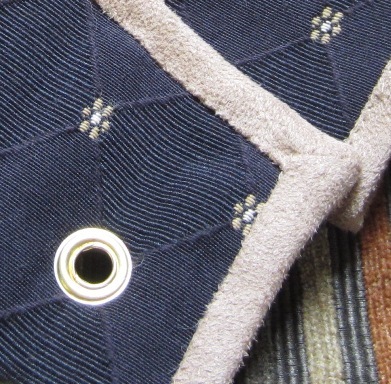 I prefer heavy-duty tarp grommets from the hardware store, although I have used the Dritz ones without issue. I don’t really recommend them, but the world won’t come to an end if they’re all you can find. I’m especially happy with the fit of the back. The previous incarnation was too long–which, when I dug out the pattern again, evidently I did on purpose. Scrawled on the pattern pieces is add 1″ to cover skirt waistband. Fail. It never, ever works to make any part of a bodice bigger unless the actual bodice is too small. I’m not sure when I’ll finally learn this lesson! Unfortunately, cutting the new version at the proper length called up the original issue: without the tabs, I get a gap between bodice and skirt. I still haven’t figured out the proper fix for that, aside from hiking the skirt way above my waistline. I found the caramel skirt at Venefica Corsetry. 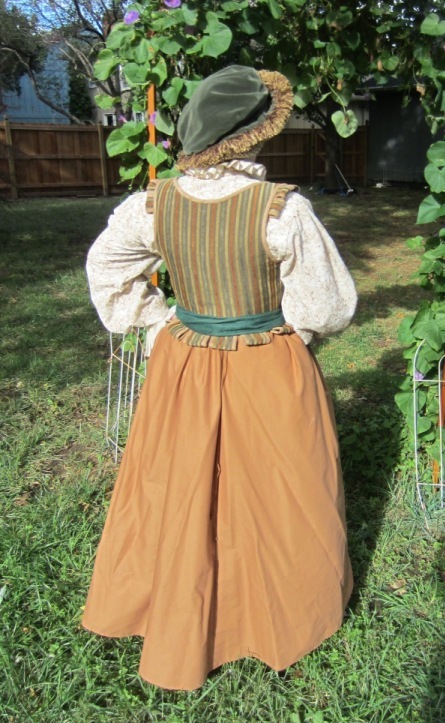 I like cotton or poly/cotton broadcloth for my wenchy skirts for practicality’s sake, but I simply could not find a pretty shade of medium golden (ie, not paper-bag) brown anywhere locally. This lovely find was a dead match for the coppery stripe in the chenille. 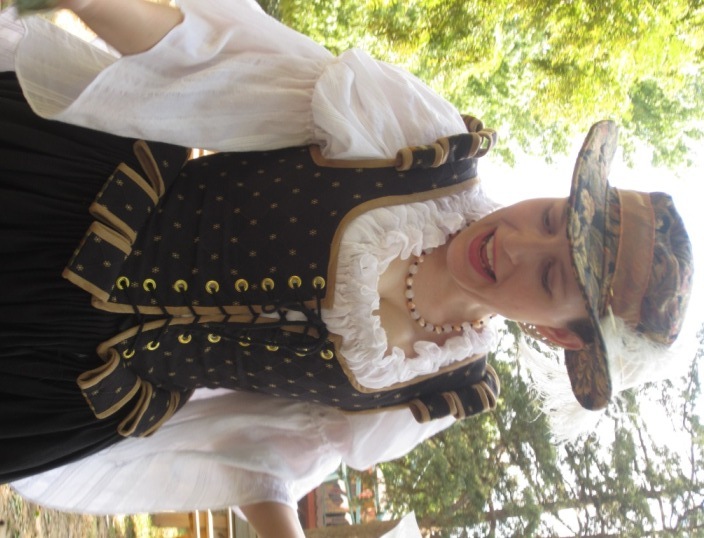 In this view, I’m wearing bloomers for the first time ever (it was about 45 degrees that morning), and I love the extra oomph they give!